Watch the trailer for the highly-anticipated new drama ‘The Broken Circle Breakdown,’ about a torrid romance between two bluegrass musicians. “The Broken Circle Breakdown won two prizes (Best Screenplay for a Narrative Feature Film and Best Actress in a Narrative Feature Film for Veerle Bartens) at this year’s Tribeca Film Festival. Co-written by Carol Joos and director Felix van Groeningen, this romantic melodrama follows the courtship of two artists as they fall in love and start a future together. It’s love at first sight for quirky tattoo artist Elise (Bartens) and bluegrass musician Didier (Johan Heldenbergh). The two bond over their shared enthusiasm for American music and culture and dive headfirst into a sweeping romance that plays out on and off stage — but when an unexpected tragedy hits their new family, everything they know and love is tested. 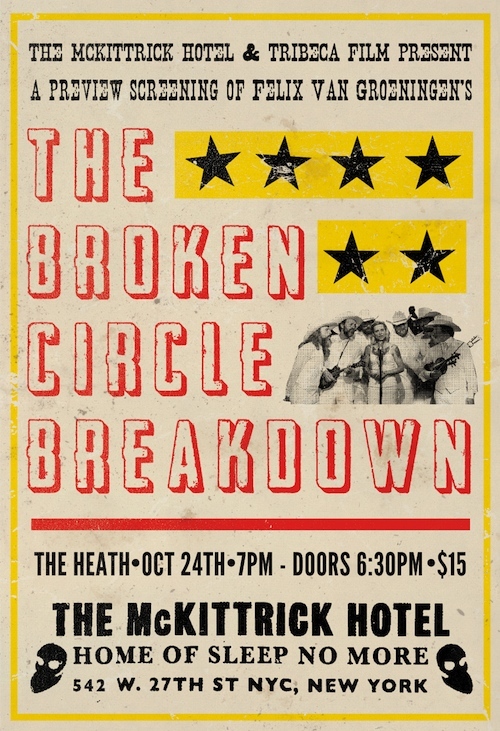 An intensely moving portrait of a relationship, The Broken Circle Breakdown, propelled by a soundtrack of foot-stomping bluegrass, is one crowd-pleasing, tear-jerking, unforgettable experience. The film’s soundtrack — scored by renowned composer Bjorn Eriksson — is currently #1 on the soundtrack charts in France and Belgium, and has become the best-selling soundtrack of all time in Belgium. Co-stars Baetens and Heldenbergh perform their own songs, and are part of the offscreen Broken Circle Breakdown Bluegrass Band, whose European tour is sold out through 2014! The Broken Circle Breakdown opens at Landmark Sunshine in NYC on November 1, and will roll out to theaters around the country soon after. You are currently viewing the archives for October, 2013 at One World Cinema.